Question: I was trying to enable desktop sharing via Vino VNC server (vino-server) on Linux Mint 17 Cinnamon desktop. However, I notice that vino-preferences tool which allows us to configure vino-server (e.g., sharing option, security, notification on/off) no longer exists. Also, I cannot find desktop sharing menu on Cinnamon desktop. How can I configure desktop sharing via vino-server on the latest Linux Mint 17 Cinnamon desktop? The latest Linux Mint Cinnamon desktop comes with vino-server pre-installed for VNC desktop sharing, but it's reported that desktop sharing configuration menu is missing. An alternative way to configure vino-server and enable desktop sharing is to use dconf-editor's graphical interface. 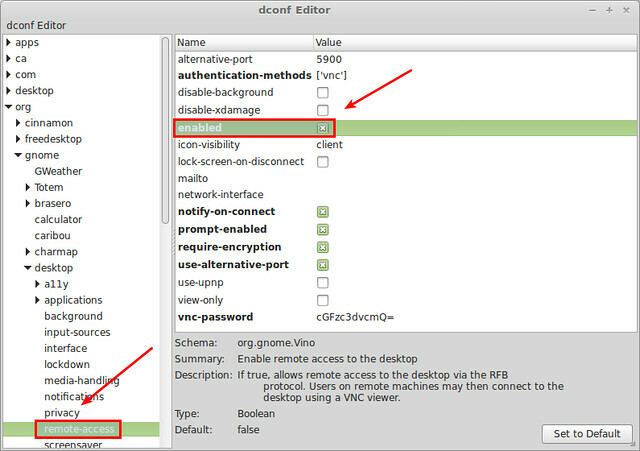 Navigate to "org->gnome->desktop->remote-access" on the left panel of dconf-editor. Then you will see various desktop sharing options. Most importantly, click on "enabled" to activate desktop remote access. Besides this, you can customize other options. vnc-password: change it to Base64-encoded string of a preferred password. In this example, we choose VNC password as "password", and its Base64-encoded string is "cGFzc3dvcmQK". notify-on-connect: shows a desktop notification when vino-server receives a connection request. prompt-enabled: a remote user is not allowed to access a desktop via VNC until the VNC request is approved by the desktop owner. 1. I am getting the following error when attempting to start vino-server. ** (vino-server:4280): WARNING **: The desktop sharing service is not enabled, so it should not be run. To enable desktop sharing service, use dconf-editor as described above. Alternatively, run the following command. Do you want to receive Linux related questions & answers published at Ask Xmodulo? Enter your email address below, and we will deliver our Linux Q&A straight to your email box, for free. Delivery powered by Google Feedburner. Did you find this tutorial helpful? Then please be generous and support Xmodulo! I have the latest Linux Mint 17.1 Rebecca with Cinnamon, but I can't find any vino program. Where to find it? Excellent - I've been looking for this for a while. I got vino running on my mint 17.3 box but I can not connect from the other linux box I get an error about : "connected to rfb server using protocol V3.7, server did not offer supported security type"
So I guess I does not work. As you can see, the tutorial is for Cinnamon desktop. I am running Mate Desktop, because Xfce and Ldxe are showing me that they are "very old" and in need of an update. I am running vnc4server. In addition to the desktops listed, I've successfully used the MATE desktop in Virtual mode." So, Cinnamon does not work, and I was looking for a way to enable desktop sharing, which is missing in the Mate Desktop. Is there a desktop that is like Cinnamon that is compatible, BESIDES what RealVNC Support says I can run?? Update: According to the official source, X2go is compatible with Cinnamon 1.4, but not with Cinnamon 2.2.